Strength Before Length: Beauty Supply Store Haul !! I ran out of my beloved DC shortly after my big chop. I had such a hard time finding it at any of my local BSS (beauty supply stores). Well Monday I found it !! I almost walked right past it, I didn't recognize it in the new jar ! Not only is the jar new, something about the consistency, color, and smell are all new !! I didn't see any changes in the ingredient list though, so I was partially confused. At first I worried if it would still give me my PERFECT results like it used to..Well I applied it yesterday night, and while applying to my hair and using my "Fenman" ( fake denman!) to get it on evenly, I immediately fell right back in L-O-V-E!! I honestly can't tell a difference in the way it made my hair look and feel (compared to how it made my hair feel in the past when I used it). Somehow the product is different though, but I just don't know how. I need to go check the Elasta site and find out..I have no complaints though !!! 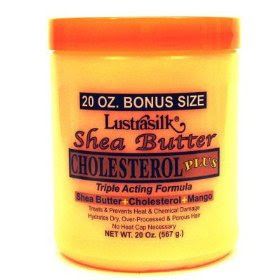 The second product I purchased was Lustrasilk's Shea Butter Cholesterol with Mango !! I hear great things about this particular product. In the past, I used the carrot oil formula on my relaxed hair, but sadly it did nothing for me. Since completing my BC, it has only done marvels !!! Go figure ... lol. Well the Shea Mango Cholesterol was just as FABULOUS !! I had to make a youtube video on how great it was =) I went heavy while applying it, because it seemed as if I didn't even apply any to the shaft. It almost felt like putting creamy water on my hair, it did nothing !!! I kept applying it though, and hoped that it wasn't a waste of my 3 dollars... Well sure enough, after letting it sit on for 30 mins, it made my hair feel sooooooo soft and it really defined the curls !! It will definitely become one of my staple prepoo/deep conditioners ! It is great to be fairly cheap. That is great for me because I don't have money to spend on a costly DC... I just want something that does great, and costs less !! I've found that in this product. I also bought some more mango butter ! It ran out around the same time as the DPR-11. 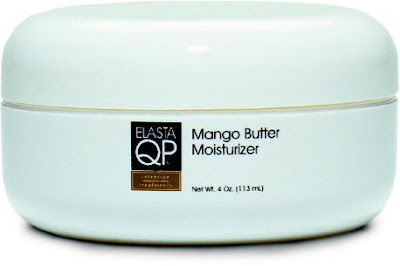 I wanted this again because I need something creamy to moisturize with when I rollerset ! My water based products would cause my hair to revert, and I'm not a fan of moisturizing with oil on dry hair unless I'm doing a hot oil treatment ! !